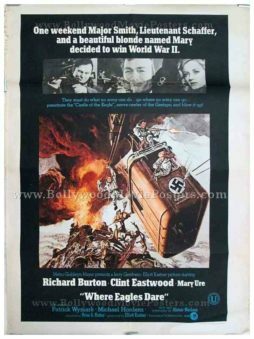 Old movie poster of the World War II film, Where Eagles Dare (1968) for sale. This is an actual surviving vintage poster of the 1968 action film starring Richard Burton and Clint Eastwood. Printed and circulated in India somewhere in the 1970s, this movie poster was originally designed for publicity of the film in India, but never ended up being used. This poster features a combination of two design techniques – hand painted / hand drawn as well as photographic still cut paste. The center of the poster features a brilliantly hand painted image depicting a key still from the film – the iconic cable car scene. Individual still photographs of the three lead characters are pasted on top of the poster. The poster is set against a black background. Interestingly, the plot of the film is summarized in text on the top. Where Eagles Dare is a 1968 World War II action film starring Richard Burton, Clint Eastwood and Mary Ure. The film was based on a book written by Alistair MacLean and became a commercial success. This is one of the first films to use front projection (green screen technology). In the film, this technology enabled filming of an iconic scene where the actors are on top of a cable car.